Triton is an old revived brand. Originally founded in 1963, a team of two frenchmen recently revived this brand. 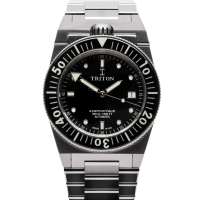 Back in 1963 Triton made a dive watch which was more expensive than a comparable Rolex Submariner. The watch is waterproof up to 500 meters. The design is quite unique and due to the crown position at 12, it is very comfy to wear. 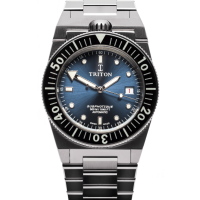 Triton Subphotique Atlantic blue dial. 40mm steel case. 500 meters waterresistant. 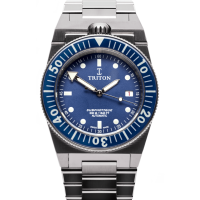 Triton Subphotique blue dial. 40mm steel case. 500 meters waterresistant.